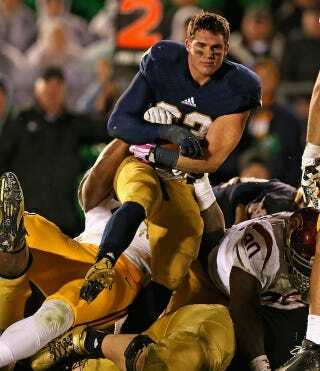 I have no idea how Notre Dame running back Cam McDaniel managed to make this face while getting pulled, helmetless, into a dog pile, but I am goddamn impressed that he did. Congratulations, Cam. You are even more photogenic than Ridiculously Photogenic Jiu Jitsu Guy, and you are officially the chillest running back in the NCAA.